The MTB ... iconic design. As the sprawling arms of the Midfield Terminal Building (MTB) get dressed in an aluminium and glass livery of blue and grey, it is clear that the new showpiece terminal at Abu Dhabi International Airport (ADIA) is fast becoming an icon on the emirate’s skyline. The distinctive X-shaped building is now clearly visible from more than 1.5 km away and aims to leave a lasting impression on the millions of passengers that are expected to use it in two years’ time – not only for its stunning architecture but also its superlative attributes in terms of sophisticated ICT and baggage handling systems, discreet but efficient security systems and sustainability. The new MTB underpins Abu Dhabi’s ambitions of raising its profile as a world-class transportation hub. “The project is an enormous undertaking that will go a long way in allowing Abu Dhabi to handle the massive growth in passenger numbers expected in the coming years,” Sulaiman Al Siksek, the chief programme officer, tells Gulf Construction. “It’s going to be the gateway to the capital city Abu Dhabi, playing an important role in raising the profile of the emirate as a world-class transportation hub, and enabling the diversification of the emirate’s economy by fostering growth in other industries through increased connectivity,” he adds. 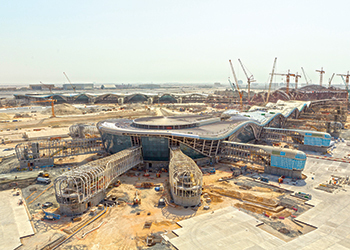 The terminal will be massive, spanning an area of 700,000 sq m, making it one-and-a-half times bigger than Terminal Three at Dubai International Airport and Heathrow Airport’s Terminal Five. 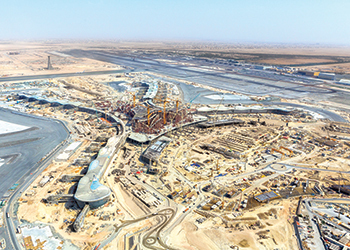 An army of 20,000 workers, supported by a fleet of the latest construction equipment which includes 24 tower and mobile cranes, is engaged on a 3.5-million-sq-m site to create the iconic terminal building that will boost Abu Dhabi International Airport’s total capacity to over 45 million passengers a year, says Al Siksek. The entire project consists of two key phases: the four-year construction phase, followed by the Operational Readiness Assessment (ORAT) phase, where during a nine-month period thorough tests of all aspects of the terminal will take place to ensure operational and efficiency readiness from the first day of operation. MTB’s major stakeholders signed a project execution plan in 2013. According to Al Siksek, to date, steady progress has been made. The first base for the MTB’s roof structure, which holds 18 arch segments, was assembled in October 2013, while the complex erection of the first elements was completed early last year by means of two 80-tonne mobile cranes and two high-capacity movable tower cranes. The mobile tower crane (D1100-63) was the biggest travelling mobile tower crane ever used in the Middle East, Siksek claims. “Last year, we commenced a revolutionary new tendering process for the Duty Free con-cessions at the MTB. The innovation and technology of the tender packs served notice both to potential bidders and to the industry that only the very best, most innovative, and imaginative of concepts will be acceptable in such an iconic building,” says Al Siksek. The project has seen significant progress over the past eight months. “At the beginning of the year, 45 per cent of the whole project was complete and by the year-end, it is expected to be 70 per cent complete,” he says. Commenting on the progress made on the project to date, Al Siksek says steel works for the four piers (concourses) is complete and good progress has already been made on the building enclosure works, including the glass curtain-walling for the four piers and the roof works. The deliveries for passenger boarding bridges are ahead of schedule, he says, adding that Pier Four was expected to see completion last month (August 2015), while the first bridges for Piers Two and Three have already been received. Structural steel work on the central processor is at 47 per cent completion (as of July 2015). “This year will also see the completion of the building envelope and glazing for all four piers. The focus will then shift towards the inside of the building: fit-out, systems integration and all other required infrastructure such as the state-of-the-art baggage handling system, with a capacity to handle over 19,000 bags per hour through its 10 reclaim carousels and 27 km of conveyors,” he elaborates. Work on building enclosure is also making fast progress and currently stands at 35 per cent complete. Work on all four pier enclosures – including the glass facades and the roof cladding – is expected to be completed by Q4 2015. The MEP (mechanical, electrical and plumbing) works stand at 43 per cent complete overall. Work has also been initiated on ensuring good links between buildings within the airport complex. “At the moment, we are in the phase of earthworks in the MTB apron area, where we are constructing a tunnel that will link the MTB to future satellite buildings. This tunnel will operate an automated people mover (APM) system when needed in the future. When operational, it will be the latest technology available, but it is still too soon to be too specific about it,” he comments. Looking ahead, tenders yet to be awarded under the Midfield Terminal Complex (MTC) Programme cover the support buildings, primarily the goods and waste facility, employee consolidation centre, long-term car-park and car rental facilities. The design is complete and the tender is expected to be awarded by the year-end, says Al Siksek. Every effort has been made to ensure that the project meets future requirements of the aviation industry. Abu Dhabi International Airport has seen a steady double-digit growth rate since 2005 and recently crossed the 20-million annual passengers (MAP) plateau. The airport is projected to grow to 24 MAP by end of 2015 and 30 MAP by 2016. Al Siksek says the project team works very closely with the stakeholders, both statutory and airlines, to ensure that the finished product incorporates as much technical and customer processing innovation as possible. He adds that the MTB has employed the highest technology available not only in the operational systems, but also in the construction phase. “We are using extensive 3D building information modelling (BIM), combined with system simulation and emulation models, which support us in highlighting any potential constructional or operational risks and support decision-making from the earliest conceptual stages,” he remarks. About 70 per cent of the work on the terminal is expected to be completed by the year-end. The MTB will employ some of the most sophisticated airport systems available worldwide today. “The Crisplant system has the capacity to process up to 19,200 bags per hour and will integrate over 27 km of CrisBelt conventional belt conveyors and a CrisBag tote-based transport and sorting system. Earlier this year, MTB signed a contract with Smiths Detection to equip the MTB with a range of systems aimed at detecting CBRE (chemical, biological, radiological, nuclear and explosives) threats. The hold baggage systems include the next generation of high-speed explosives detection capabilities, deploying a combination of X-ray technologies to produce high-resolution images of baggage contents. There will also be 3D workstations for outbound equipment screening by the police, and 2D workstations for the inbound screening by customs. For carry-on baggage screening, state-of-the-art Atix (advanced threat inspection X-ray) systems will be deployed, supported by trace detection sensors, bottle liquid scanners, and radiation detectors. In addition to the unmatched security level that the new technology will offer, it will also deliver smooth and fast processing of passengers and luggage. The terminal will employ the most sophisticated airport systems available worldwide. The MTB has been designed and is now being constructed as per the requirements of Abu Dhabi Urban Planning Council’s Estidama Pearl Building Rating System (PBRS) and in September 2013, it received a Three Pearl rating from the Estidama. “The MTB is now the highest rated airport terminal in the GCC, and the largest singular building ever to be rated globally,” Siksek stresses. The building utilises a number of design techniques to minimise energy consumption. For instance, the building envelope has been designed to minimise the flow of energy from outside into the building by a number of different technologies including deploying a varied ‘frit pattern’ on the glass surface, which is a hard-wearing ceramic that acts as a shade and poses minimum disruption to vision through the glass. “At lower levels, where there is a requirement to see the apron and the planes clearly, the glass is clear, whereas when viewing the sky, it is more opaque, thus allowing natural light to enter the terminal but blocking the heat from the sun,” says Al Siksek. In addition to the frit, there is also a microscopically thin metal coating of silver and other metals that filters the light by invisibly reflecting the heat energy within the infrared spectrum, whilst letting through the desired visible light. The glazing has layers of laminated glass that not only provide safety and security but also absorb the harmful ultraviolet light for the benefit of passengers and interior finishes. In the solid area of cladding, the facade has been detailed with high-performance insulation that further minimises the energy transfer through the envelope to reduce the energy required to cool the building. The solid cladding comprises of an external layer of non-combustible composite aluminium panels which is lighter than other potential solutions, whilst retaining a consistent colour and finish, he says. “The façade is predominantly manufactured in factories and just clipped together on site, so important junctions where leaks could happen are sealed in controlled factory conditions. This ensures the highest quality end product whilst minimising the labour force that would be required if it was completely assembled on the building,” explains Al Siksek. The MTB was designed to achieve a considerable reduction in annual energy consumption through the specification of an appropriate and climate-responsive building form and façade, which will feature high-performance low-e double-glazing to reduce solar gain, and low U-values specified for the walls and roof to minimise heat gain. Substantial energy demand reductions will also be achieved through the use of a highly efficient lighting system and an adaptive and effectively controlled HVAC (heating, ventilation and air-conditioning) system. Limiting the use of potable water was a priority in the MTB design. Water demand was specifically studied and water fixtures were selected based on their ability to maximise reductions. In doing so, the MTB can achieve and maintain a reduction in water consumption of 45 per cent over a comparative baseline case, according to Al Siksek. Furthermore, there is a commitment to divert a minimum of 75 per cent of construction waste from landfills during the construction phase. In addition to using recycled materials where practical, regional materials have been selected for the construction of the MTB to reduce the demand for fossil fuels for transportation purposes. A project of this scale undoubtedly will draw up impressive statistics. 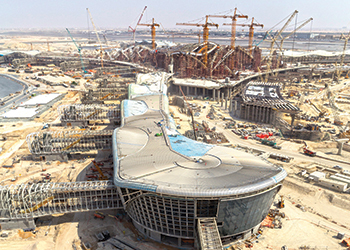 On completion, the construction of this striking landmark will have utilised a total of 672,838 cu m of concrete, 63,507 tonnes of steel, 433,957 sq m of roofing, 161,588 sq m of curtain-walling, 106 passenger boarding bridges (PBBs), 27 km of baggage handling systems (BHS), 224,237 sq m of stone flooring and 14,041 sq m of ceramic tiling.